Cigarette silks, a type of tobacciana, were premiums redeemable by mail order or found enclosed in packages of cigarettes. These became popular in the early 1900s, with trading cards distributed in cigarette packages being their predecessors. Most of these small fabric pieces were sewn together to fashion lager textiles such as quilts and table covers. Some cigarette packages even included instructions for industrious homemakers to follow when piecing these together although few women actually smoked in those days, at least not openly. In comparison to cigar ribbon textiles, cigarette silks are harder to come by. “I find more cigar ribbon stuff by far than cigarette silk pieces, especially in terms of larger quilts. Given that every city in the U.S. probably had a cigar factory the logic is this stuff was more readily available than cigarette silk premiums which mostly had to be sent away for,” said Laura Fisher of Fisher Heritage in New York, a purveyor of textiles made with these materials. Cigarette silks were “published” in sets, or a series, intended to be worked into textiles in a coordinated fashion. Theatrical performers, American Indians, Oriental rug patterns, flowers, and butterflies, along with a number of other themes, can be found sewn into quilts and along with other small textiles fashioned of these fabric pieces. Some of these are interspersed among other fabric accents in coordinating colors, as shown here. Others are comprised entirely of one series of silks pieced together as shown on page 4 of this article. This detailed view shows a single cigarette silk that was fashioned into a quilt in close detail. Some of these small fabric pieces used to make quilts and textiles were printed in color. This particular example was part of series that featured similarly styled black illustrations printed on white or colored silk which was fashioned into the quilt. Images of beautiful women were commonly used to pitch products at the turn of the 20th century, and they also appeared on numerous cigarette silks which were sewn together to form quilts and small textiles such as table covers. 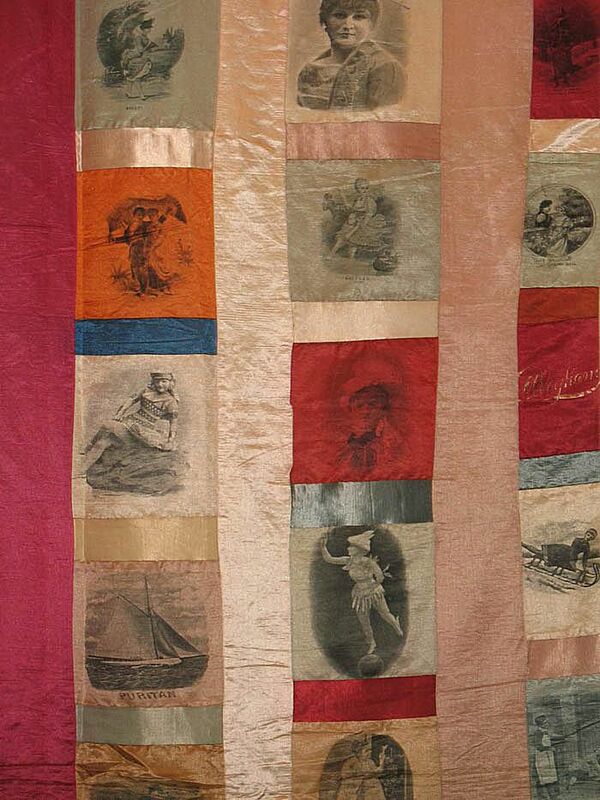 The silks shown here were fashioned into a quilt offered for sale by Laura Fisher of Fisher Heritage in New York, a seller of textiles specializing in this type of ware along with items made from cigar ribbons. Cigarette silk quilts are not as common as cigar ribbon quilts, but they are as costly to acquire on the secondary ​antique market. Quilts made of cigarette silks usually sell for $1,000 and up depending on the pattern, quality of the construction, and condition, since silk can become quite fragile over time. Larger quilts usually bring several thousand dollars when purchased from a dealer specializing in antique textiles. Smaller items, like the aforementioned table covers, tend to begin at around $100 and go up from there based on the same attributes as quilts.